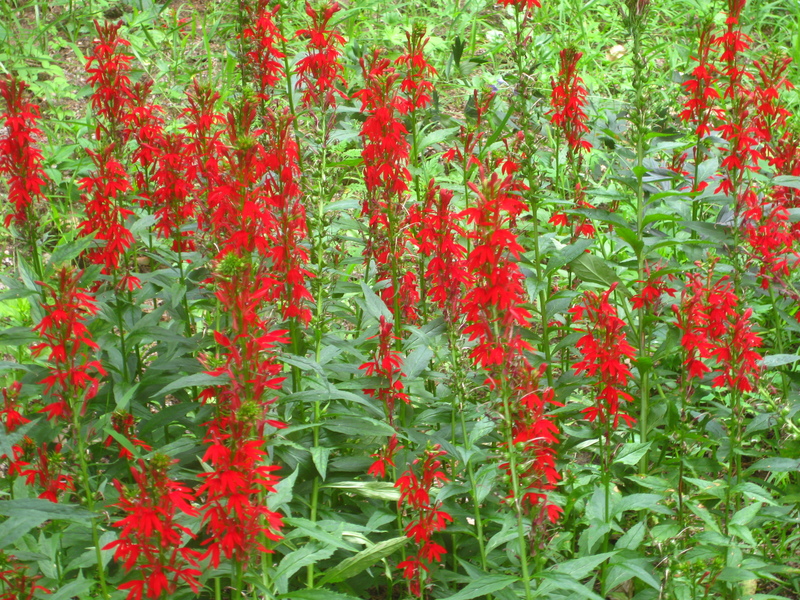 Cardinal flower, Lobelia cardinalis, is a great native hummingbird plant. Like many good hummingbird plants, it has vivid red flowers that hummingbirds love. What really sets it apart from others is it’s ability to tolerate shady areas of the garden and thrive in less than well-drained soil–most of the best hummer plants demand much more sun and well-drained soil to perform at their best. It helps that the plant’s peak blooming period, late July through early September here in Minnesota, coincides with the period when fledgling hummingbirds join the adults in our gardens and wild areas seeking nectar, and when all the hummers, adults and young alike, are feeding much more in order to fatten up for the long southbound journey to wintering areas in Mexico and Central America. I like to say that compared to the spring and early summer, there are twice as many birds around and they are twice as hungry! Cardinal flower has an interesting range in North America. The species ranges throughout the eastern and midwestern states into southern Canada and typically grows in floodplain forests and along stream margins. Somewhat surprisingly, the range extends into riparian areas in the otherwise arid Southwestern United States, as far west as Southern California. In the once found an emergent plant blooming in the middle of a stream in Guadalupe Mountains National Park in West Texas. The western subspecies, L. cardinalis ssp. graminea, has narrow leaves than the typical eastern form and I’ve germinated seeds from some western populations that have pink flowers, rather than the typical red. I planted out many of the seedlings in one of my perennial beds and they have grown and bloomed well for me this year. The seedlings came true, and the pink flowers seem to attract hummers as well as the red ones. I had some doubt about their hardiness here when I planted them out late last summer, but they managed to survive last year’s mild winter in my zone 4 garden. 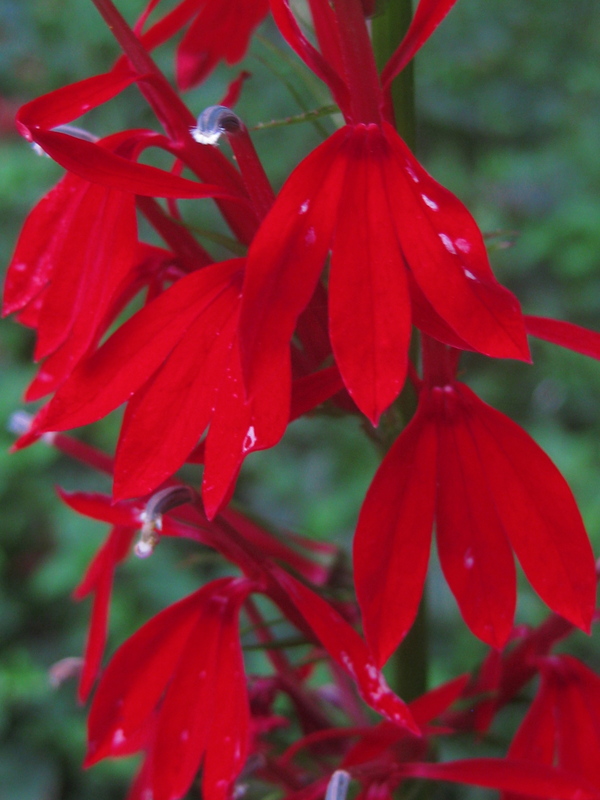 Cardinal flower is easy to grow from seed, but the seed does require cold stratification. Seed is easily collected in quantity from the brown seed heads in the fall. The seed is very fine, like dust. I usually collect some seed and wintersow a couple of containers which will then germinate the following spring. Try not to sow the seed too thickly (very hard to do with such fine seed). I’ve found the seedlings to be very tough. I can take a flat that is a solid mat of green seedlings on the surface, rinse the soil away from the tiny roots, and carefully tease apart the many tiny seedlings and pot them up. Most of them will survive the ordeal, and they can be planted out in the garden in late summer or the following spring. They will bloom the following summer to fuel the migration of the next generation of hummingbirds. Interesting info. I’ve often thought about trying it. I’m glad there are pink forms of it–that’s my favorite color. Sue: You (and your hummingbirds) won’t regret trying it. At least one mail-order nursery, Sunlight Gardens, has Lobelia cardinalis in different shades of pink. I didn’t mention it in the post, but there are a number of commonly available hybrids with related mexican species that aren’t as hardy as Lobelia cardinalis. 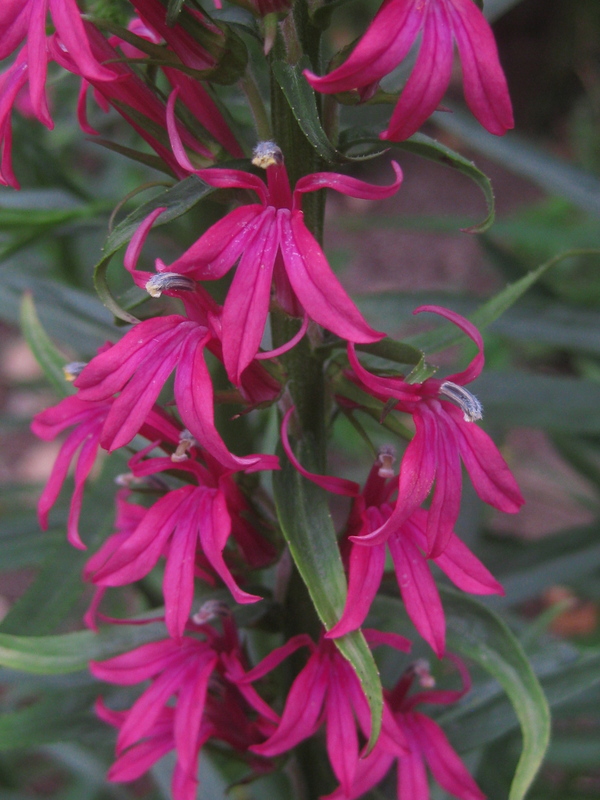 Also, there are a number of hybrids with a hardy, blue-flowered, bee-pollinated relative, Lobelia siphilitica. These hybrids, although beautiful, may not produce as much nectar as L. cardinalis, because L. siphilitica does not produce as much nectar as L. cardinalis. Colmel: I’ve never had one grow quite that tall! Four or five feet has been the max for my garden. I find that the ones planted in richer soil that get more sun grow taller, but they are also more likely to topple in high winds.